We’ll be taking a look at our reviews of the best grow box cabinets that work great for growing indoors. Along with that we’ll also be answering some common questions you might have about them. Here are our picks for which ones we recommend. The Cloudponics GroBox is the best of the best. These are the grow boxes of the future, I mean you can literally control the growth of your plants inside this grow box with an app on your phone. Not even joking! I could talk about this product awhile so I’ve written an article dedicated solely on reviewing the Cloudponics Grobox. There is to many features to list here but some of the main ones that make this grow box amazing is things such as; Ambient & pH control, a drying mode, nutrient mix reservoir & it’s own app to be able to control everything from your phone! I really like the sleekness of this box. It may look out of place in a dorm or a bedroom but somewhere in a nice kitchen area would make a perfect fit. The Cash Crop 5.0 is a three-foot grow box/grow cabinet that is one of the hottest-selling in the market today because of its price point and complete system. The grow box comes with highly reflective interior lining material, a grow bed with integrated nutrient reservoir and lighting. The accessories and equipment for both systems are the same. The only difference is the height of the grow tent itself. The Yield Machine Max is a four-foot grow box that comes complete with the entire growing system for cultivating plants indoors. At four feet, the Yield Machine Max offers plenty of space for multiple tiers and rows of plants. With this much space, you can grow several types of vegetables and herbs, so plan your garden carefully. This grow box is four feet tall, 17.5 inches wide and has a depth of 13.5 inches. The hydroponic basin included is now three times larger than the basic included in the last iteration of the Yield Machine Max. That means you have access to a higher volume of nutrient solution, which can support more plants. The depth of the hydroponic basin has a direct correlation with the number of vegetables/crops you can grow in a single grow box. The Yield Machine Max comes with its own lighting bracket and a 150-watt high-capacity LED grow light. The nutrition of your plants is also taken care of as you will receive one full bottle of FloraGro, Floramicro, and FloraBloom. 4.75-inch intake and outtake fans are also installed in the grow box, so you will have more efficient climate control. Things can get pretty warm in a small, closed space with a reflective interior, so it’s essential that you also monitor the ambient temperature and humidity of your grow box to ensure that your plants are not over-heated or cold. They say that grandma knows best. We think so too! So it’s enlightening to know that Dealzer has actually named its top of the line model as Grandma’s Secret Garden 3.0, because, in its third iteration, this grow box has gotten bigger and better. Dealzer’s latest redesign of Grandma’s Secret Garden has upgraded this model to be able to support up to nine adult plants at a time. Dealzer also offers a lifetime warranty on the product, plus rapid online and phone support in case you need to clarify something when you begin operating it. This grow box/cabinet measures 36” tall, 16.5 inches wide, with a depth of 16.5 inches. What this grow box lacks in height, it has made up for in its width and depth. Grandma’s Secret Garden 3.0 comes with its own lighting system with two types of bulbs. The first type is the 6500K grow bulbs. These generate the heat needed by the plants for general growth and development. The second type of lighting is less intense at 2700K and was designed to improve the flowering of growing plants. The 2700K and 6500K bulbs provide sufficient lumens to simulate outdoor conditions, so you can easily produce healthy crops. It’s also worth mentioning that Dealzer has a special yo-yo system for lighting that allows you to elevate or lower the light bulbs, depending on what the plants need, specifically. Super things can truly come in small packages. The Supercloset Superbox 200-Watt Fully-Automated Turnkey Growbox is one of the best-in-class grow cabinets on the market today. Get a load of Supercloser Superbox’s 16-gauge steel framework, lockable front closure, and fireproof canvass. With this type of durability, you can be sure that in the event that something happens to your home while you’re away, your hydroponics system will survive, especially the crops you’re growing inside. It might sound a little excessive, but hydroponics growers know how it feels to lose their crops. It takes a hefty amount of work to make a new hydroponic system click, so the enclosure has to be tough. 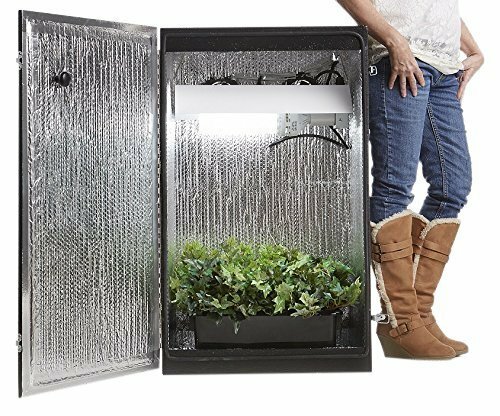 This grow box has been streamlined to look like a small refrigerator, so it will look sleek and pretty when you put in anywhere in the house. Who said hydroponics setups can’t be stylish? 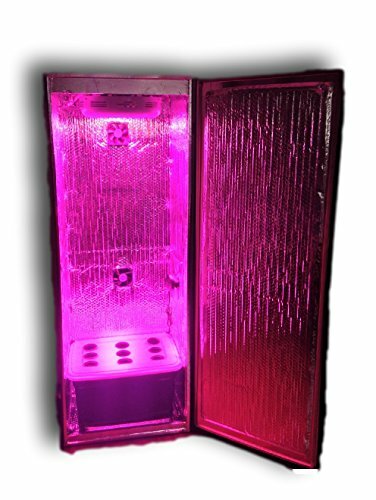 You can also tend to a total of ten adult plants in this grow box, and it comes with its own 200 watt CFL grow light. While some practitioners say that CFL lights produce less heat and lights, commercial hydroponics growers use CFL all the time. Since you’re only using a small space, light and heat are maximized and preserved easily. Since this is an excellent turnkey system, the package includes not just the grow box and nutrient basin, but also rockwool cubes, TDS meter, filters and hydroton rocks. Within ninety minutes, you can be up and running your very first hydroponics system! The Grow Box LED SuperLocker 3.0 is one of the finest-looking grow boxes right now. It’s tall, matte black and looks absolutely stunning with its separate compartment for lighting and lots of space for additional tiers in case you want to modify the interior later on. 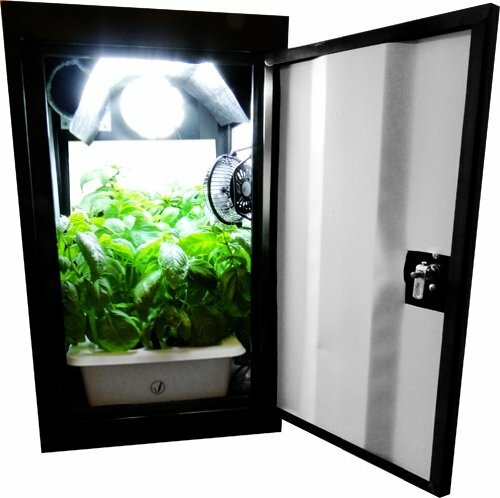 The Grow Box LED SuperLocker 3.0 measures 66” tall, 15” wide and 24” deep. This is the biggest of the grow boxes we’ve reviewed today and it’s an exciting grow box because it is close in size to a grow tent that is used for more intermediate and sophisticated hydroponics systems. In its default orientation, you will be able to grow up to eight adult plants. Feel free to grow any crop inside because this grow box is one sophisticated lady. If other grow boxes offer inlet and outlet fans for heat control, the SuperLocker 3.0 has its own internal circulation system that is connected to filters that remove odors from the grow box. No more struggling with strange/natural odors. The system will take care of that for you easily. There’s also a net trellis inside so you can manage adult plants when the begin elongate and bend. It’s all about preparation when it comes to indoor hydroponics. Included in the package are hydroton rocks, TDS tester and other goodies you’ll need to get up and running quickly. Before starting with any hydroponics project, read up on it. Understand what goes into the process of growing plants in a soil-free environment. Grow boxes provide an automated system, but for the most part, you will still be in charge of making the grow box flourish. The pH level of the nutrient solution is indicative of its content. You will need to study how nutrient loss affects the salts in the water, and you’ll need to adjust by adding more nutrients. Certain plants need more heat/light. Understand the basics of the plants that you will be introducing to the grow box/grow cabinet and adjust the lighting of your grow box accordingly. Remember: you are not limited at all by the lighting system that is built into a grow box. You can modify if you need to. You can upgrade if the plants you’ve chosen to cultivate require more light. Generally speaking, HID lights provide more light output but can get become very warm. This means the system has to compensate by drawing out heated air out of the grow box. This is the reason why many modern grow boxes have internal circulation systems added – because climate control is just as important as introducing heat and light to the plants. Learn to experiment. If you’re not satisfied with the scale for cultivation that a grow box provides, don’t discard it. Instead, learn to modify or integrate the grow box to more equipment or a separate system so it becomes more efficient or at least, it won’t be discarded. think about. Why grow stuff in a box? A grow box is actually more sophisticated than it sounds. A grow box is actually a mini-mini-version of a greenhouse, even smaller than a grow tent. A grow tent is a tall tent, usually lined with Mylar (a reflective material) that can accommodate grow beds, a stand and other equipment needed to grow plants indoors. A grow tent is basically an indoor greenhouse, minus the equipment. A grow cabinet or grow box, on the other hand, is not just a small grow tent, but a complete, integrated system that is self-contained within the small cabinet. When we say ‘integrated’ we really do mean things are integrated within. All the components of a functioning hydroponic system are already inside the grow box, from the nutrient reservoir, nutrient solution, grow beds, stand for the grow beds, grow beds, lighting, etc. If you are just starting out with hydroponics or if you feel that you do not have the technical know-how yet to assemble your own system from scratch, then grow boxes are the right choice for you. With a grow box, you will be able to cultivate flowering plants, microgreens, leafy vegetables and herbs right from the comfort of your home. There will be no need to purchase additional equipment unless you want to upgrade the water pump or the wattage of the light included in the grow box. Why Buy A Small Grow Box? Smaller grow boxes can accommodate a limited amount of plants, which is alright if you’re not planning to cultivate several kilos of vegetables at a time. If you’re thinking of growing microgreens for shakes, as well as leafy vegetables for salads and other dishes, then these smaller grow boxes are certainly a good choice. Yes, grow boxes can certainly be upgraded. The main impediment, of course, would be the size of the interior, but all the same, with a bit of ingenuity you can easily improve upon an existing design with the addition of stands and brackets. 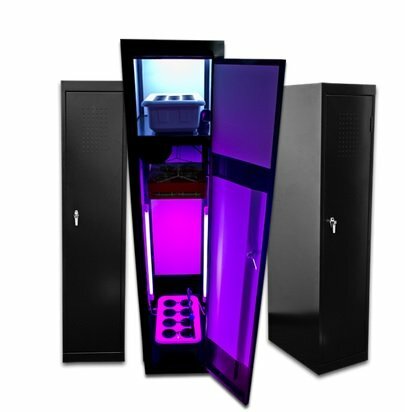 Where To Buy A Grow Cabinet?! Grow boxes/grow cabinets are widely available in the market, and there are a ton of new features being added regularly by manufacturers every season. We’ve taken the liberty of identifying the best grow box cabinets for you, so you can pick the one that’s right for your needs and hydroponics project.